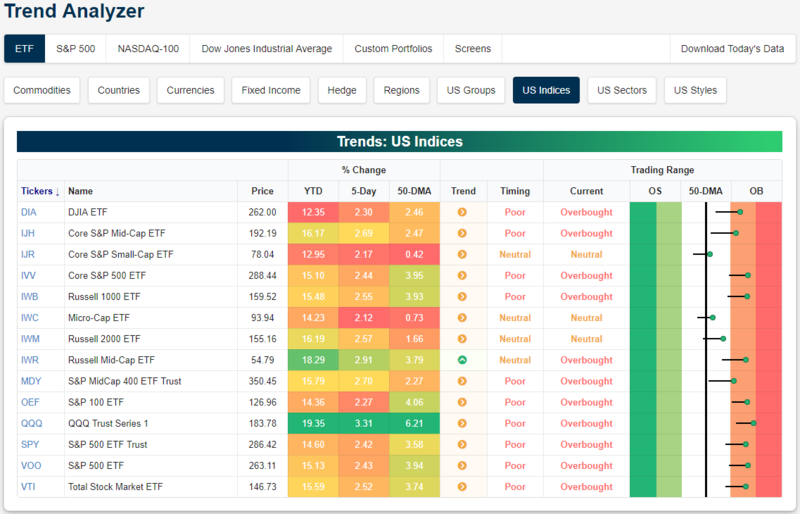 As seen through the long tails in our Trend Analyzer, this time last week, the major index ETFs were mostly neutral with some below the 50-DMA. Gains over the week have certainly shifted things towards overbought as now there are only three neutral ETFs while the rest are overbought. The Nasdaq (QQQ) continues to be a leader as it has risen more than the other indices on both a year to date and weekly basis. Currently, it is up 19.35% YTD and up 3.31% in the past week and as a result is pushing on extremely overbought levels. While the others have a little further to go until reaching extreme levels, they are firmly overbought. Small caps remain the exception to this. In spite of all gaining over 2% over the past week—basically in line if not slightly less than the other indices’ gains—small caps continue to sit right around the 50-DMA. The Core S&P Small Cap ETF (IJR) and the Micro-Cap (IWC) are only 0.42% and 0.73%, respectively, above the 50-day. Granted, this is an improvement from sitting under the average last week.